The British Army withheld evidence for more than three decades which confirms that some of its locally recruited units were used to finance and support UVF paramilitary death squads. At least 70 soldiers on one base were linked to the loyalist murder gangs. 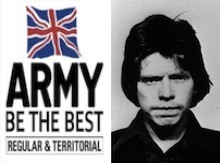 According to a report by The Detail, top secret government papers disclose that the British Army’s Ulster Defence Regiment (UDR) was heavily infiltrated by the UVF in the late 1970s. •	One collusion ‘investigation’ was suspended after a senior UDR officer warned it was ‘damaging morale’. However the top secret papers, which were brought to the attention of then British Secretary of State Roy Mason, have been kept hidden for nearly 35 years. The documents show that British army chiefs took a deliberate decision to cover up evidence exposing the fact that the UDR battalion had been seriously compromised by the UVF, including a serial-killing member of the ‘Shankill Butchers’ gang who carried out over thirty sectarian murders. The family of one Shankill Butchers’ victim, who was brutally hacked to death in Belfast in 1977, has now challenged the British army to explain why it deliberately covered up the collusion link between the UDR and UVF. Joseph Morrissey’s daughter Charlotte has called for the information to be released.